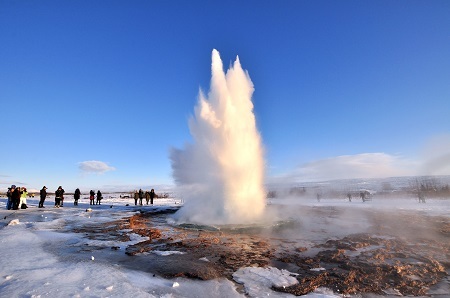 In March, Nicola Atkinson, branch manager at our Ipswich travel agents, went on holiday to Iceland for 3 nights. She had an amazing time and this is what she got up to. On Arrival in Reykjavik, we took a walk around the city, including visits to Hallgrimskirkja cathedral and the city ponds. The ponds were still frozen and you could walk over them. You only need half a day to explore as it really is a small city. On our first night, we went in search for the Northern Lights. On leaving the city, we were taken to a National Park, where it was pitch black with only a Small Café nearby. We arrived at 9pm and it was already freezing cold, but the odds to see the Lights were in our favour as we had clear skies and the sun had been out that day. So we waited and we waited and the temperature got down to as low as -11 degrees. Half 11 was soon here and still we had not seen the lights. We all got back on the coach to go to a different location and then all of a sudden the tour guide started shouting “they are here, they are coming”. We rushed off the coach and went behind the café where the sky was clear and you could just see a green twinkle in the stars. Shortly after a faint green light appeared in the sky and the lights started dancing across the darkness. They became brighter and brighter; it was such an amazing experience to stand in a National Park in the middle of Iceland and witness the beautiful Northern Lights. The next day, we went on the Golden Circle Excursion, a popular tour for many visitors to Iceland, which took us to the three best sights in the south-west of the island. First, we stopped at Þingvellir National Park, a historical and geological wonder where the North American and Eurasian tectonic plates are pulling apart at a rate of a few centimetres per year. We then travelled to Gullfoss waterfall, where the water plummets down into a 32-meter deep crevice in two separate steps. There is a small café where you can sit and watch the falls and try some of Iceland’s famous soup. After Gullfoss, we visited Geysir. This is a geothermal area where the most active hot spring, Strokkur, spouts steaming water up to 30 meters in the air every 8 minutes. It was fantastic and fascinating to watch. After a long day, we headed back to the city had a quick meal at a local restaurant before chilling out by the fire in the hotel bar. On our Final day, we took a trip to the world-famous Blue Lagoon. 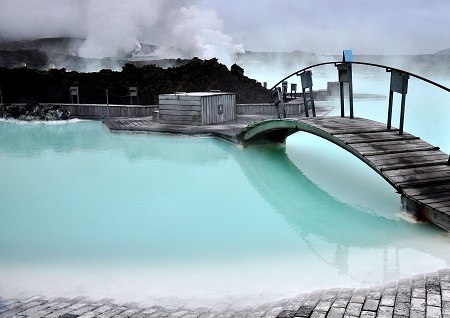 The spa is located in a lava field in Grindavík and the warm waters are rich in minerals like silica and sulphur. Bathing in the Blue was truly relaxing; the water temperature in the baths and swimming area of the lagoon averages 37–39 °C (99–102 °F). Whilst relaxing in the lagoon we applied the silica mud mask. You put it on your face and body and leave for 15 minutes before washing off. In our package, we also got the algae mask included. This is applied to the face, left again for 15 minutes and then washed off in the Lagoon. Afterwards, you really do feel a significant difference in the softness of your skin. The Blue Lagoon is definitely a place to go and relax for the day, not forgetting to try the homemade smoothies at the swim-up bar. Our last evening was spent enjoying a nice meal in Reykjavik. The city really does cater for everyone, offering everything from American Grills to Fish and Chip shops and local Icelandic cafés and restaurants. It can be expensive to eat out in Iceland so make sure you take plenty of Krona. A meal of fish and chips in a local restaurant is roughly £20.00. Overall, I had a fantastic time in Iceland, including some amazing experiences that have left me with a desire to go back and discover everything else there is to see. If you would like to plan your own trip to Iceland, our friendly team of staff can talk you through every stage of booking. Drop by our shop in Ipswich to speak to Nicola, or you can visit any of our other East Anglia travel agents, as well as those on the south coast. Signup to Fred. Olsen Travel newsletter by simply completing the form below. As one of the UK’s most established travel companies, Fred. Olsen Travel provides outstanding customer service, choice and value for money through our six distinct specialisms. Bonded by the Association of British Travel Agents (ABTA) and by the Civil Aviation Authority’s Air Travel Organisers Licensing (ATOL) scheme, you can look forward to your next adventure with the peace of mind that your booking is financially protected in the event of unforeseen circumstances.